The purpose of this craft is to show your children how ritualistic the Pharisees were, and how they let their rituals become more important to them than following God. A Pharisee was one of the three major Jewish religious groups at the time of the New Testament. The word Pharisee means "separated ones". They were also known as chasidim which meant "loyal to God or loved by God". They sought to obey God, but they eventually became so extreme in some parts of obeying the laws that they didn't realize they were missing other parts. They also added many laws of their own. Their rituals became more important to them than serving God. When they saw how much power Jesus had they were very jealous of him, and when Christianity starting spreading, they became one of its biggest opponents. Paul was a pharisee. 1. Glue the body pattern onto the cup and then glue on the arms and feet. Explain what the phylacteries were and why the Pharisees used them. Pharisee took Deut. 6: 8 literally and tied boxes filled with God's words on their foreheads and arms. Phylacteries are cube-shaped leather cases with scripture verses in them. The phylactery that was tied on the inside of the left arm was placed near the elbow so that when the arm was bent the phylactery would rest over the heart. The knot fastening it to the arm was in the form of the Hebrew letter yodh (Y) and the end of the sting wound around the middle finger. 2. Make the Hair and Forehead Phylactery - To make the hair loosely wind yarn around the 5" x 5" pieces of cardboard about 25 times and then pull it off. Tie the yarn together in the middle with another piece of yarn. Cut the looped ends to make a pompom. 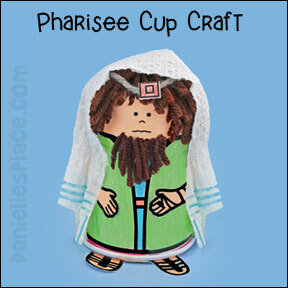 Glue the pompom to the bottom of the cup for the hair, and then give the Pharisee a haircut. Children may also want to glue pieces of yarn to the beard. Explain that the Jewish people only wore their hair long if they were carrying out a vow. A few had a lifelong vow, but most would only let their hair grow for a short period of time, weeks or a month. Some religious groups would not cut their beards, but some would. The fringes on the Pharisees robes were supposed to be a constant reminder of God's commandments (Number 15: 38-41), but the Pharisees made the fringes extra-long, putting on a show wanting to look more spiritual than others. In Matt. 23:5 Jesus scolded the Pharisees for making their fringes longer to look more important. The Tallit or Prayer Shawl - http://www.templesanjose.org/JudaismInfo/faq/tallit.htm - This is very interesting reading and explains what the blue stripe means and why they don't put them on the tassel any more. 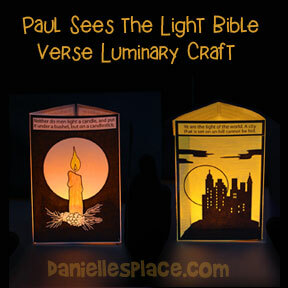 Each panel on this three-sided luminary depicts part of the Bible verse. Matthew 5:14-15 "Ye are the light of the world. A city that is set on an hill cannot be hid. Neither do men light a candle, and put it under a bushel, but on a candlestick; and it giveth light unto all that are in the house." 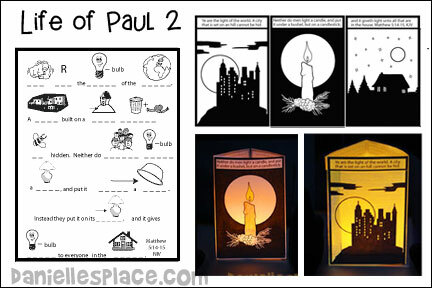 This craft goes along with the Bible lesson "Paul Sees the Light" on The Resource Room. 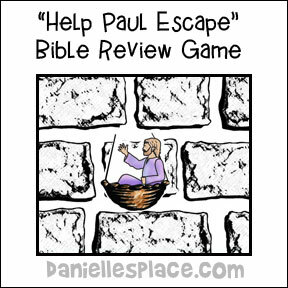 The printable map and pictures for this activity is available to members of The Resource Room on the lesson "Paul Escapes Over a Wall". Children color the map and pictures and then cut the pictures apart. 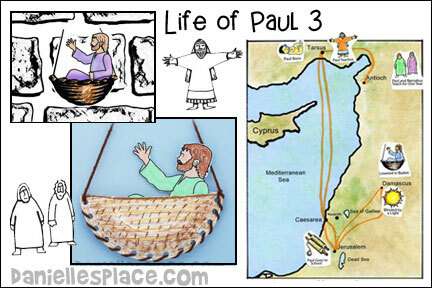 If you have younger children you can use the colored map as a visual during the lesson and have them make Paul in a basket craft below. As you review the lesson have your children glue the pictures in the appropriate place on the map. 3. Sun picture - Glue to Damascus where Paul is blinded by the light. 4. Paul teaching - Paul teaches in Damascus. 5. Paul in a basket - Glue to the city of Damascus. In this game children compete to be the first team to "lower Paul over the wall and bring him safely to the bottom". The teams take turns answering questions. If a team gets the question correct, the teacher moves the Paul in a basket picture down one row of stones. The team whose picture of Paul reaches the bottom of the wall first wins. I just used your resource room materials for the first time this month. So far I found it very helpful. I am the SS Superintendant for my church and I really find it time consuming the other way I used to prepare for the prek/kindergarten class. Your site helps me save time. I loved the stories and the craft ideas, well, I never would have thought of such cute ideas. The kids love it too. We started this year with the stories of God creating the world, then, animals (even spiders..yuck). We have had a great time with them and we like to keep their lessons simple and crafts simple as well. Thank you for sharing your talent God has given you, I'm very happy with everything I find on your website. Peace, Blessings and Joy, Laura J. Acts 9:25 - Paul's followers took him by night and lowered him in a basket through an opening in the wall. 1. Cut paper plates in half. Place to halves top side to top side to form a basket, and glue them together. Punch holes around the edges. 2. In class have your children color the "baskets" and then thread yarn through the holes leaving about one foot of yarn on each side of the basket. Tie the ends together over the basket. 4. 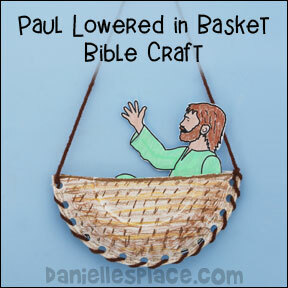 Have your children draw and color a picture of Paul and place it in the basket. 5. Use the craft to act out the story. Make a snake with plastic bottle caps from soft drink products and two corks for the head and tail. Drill a hole in the center of each cap and the corks. String red plastic cord through one small cork then 25 plastic caps per snake and end with the other small cork. For other snake crafts go the the Snake Crafts Page. Work on the Coloring Sheet "Paul and Silas"
Before class print out the Paul and Silas Pattern and make copies. Print out the Jail Pattern and make copies. Cut out the center of the pattern, and cut up thin strips of black construction paper. In class have the children color both pages and then glue the black strips of paper to the back of the Jail Pattern. Staple the Jail Pattern over the Paul an Silas Pattern on the left hand side. Cut up black construction paper into 3/4" x 4 1/2" pieces. Cut up pieces of construction paper 7" x 1 1/2" for the wristbands. In class have the children glue the smaller pieces together to make a chain. When they are finished, tape the larger pieces of construction paper to the chain at both ends by placing pieces of tape through the end loops of the chain and taping them to the middle of the larger pieces. You will be taping the wristbands (end pieces) to the child's wrist at the end of the lesson. Act out the Bible Story - Divide the children in half. 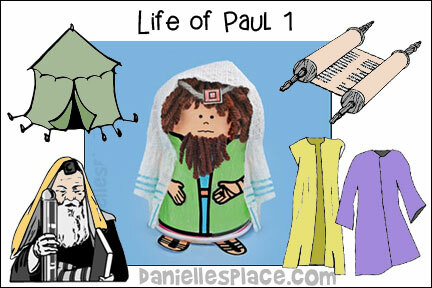 From half, pick a child to be the jailer and one to be Paul and one to be Silas (Children who like to sing). Have the rest of the children be prisoners. The second half of the children will be the audience and sound effects people. Tape the paper chains around the prisoner's wrists and tell them to get in the jail. Have the jailer lie on the floor off to the side and pretend to be asleep. Tell the children that Paul and Silas will start to sing (If the children don't want to sing, just tell them they can pretend to pray) and when they hear a banging noise they should stomp their feet and pound on the table to make it sound like an earthquake. The prisoners in the jail should pull apart their chains and act very surprised. When the earthquake has stopped tell the jailer to wake up and look frightened and to draw his sword. At this point Paul should yell, "Don't hurt yourself! We are all here!" The jailer then goes up to Paul and asks, "What must I do to be saved?" Paul answers, "Believe in the Lord Jesus, and you will be saved." 1. Before class make a set of Key Cards with questions about the lesson. 2. Make a spinner board and glue it to a thick piece of cardboard. Cut a spinner and attach it to the middle of the spinner board with a paper fastener. 3. Designate one part of your room as the jail. You can set up chairs in a square with an opening or make a jail out of cardboard boxes. Have your children take turns spinning the spinner. If the spinner stops on the jail side, the child has to go to jail. If it stops on the key side, he gets to answer a question. If he answers it right, he frees everyone who is in jail.